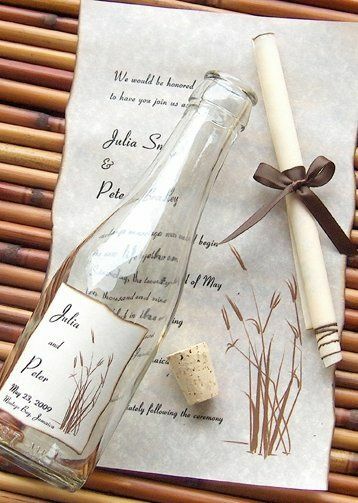 About Message In A Bottle, Inc.
What makes a business worth your time and money when preparing for your wedding? Originality, accountability, and accessibility. 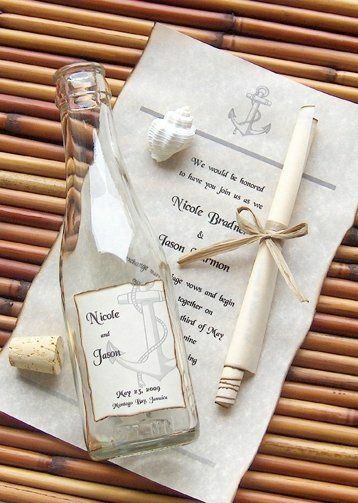 Here at Message In A Bottle, Inc. we are here to meet your needs and walk you through the invitation process one step at a time. Why is it important to have a reliable team to work alongside you as you prepare your invitations? The answer is simple. Wedding invitations are the beginning of your forever. Before you invite people to witness the commitment you are about to make you want to know without a doubt that everything will be presented perfectly. 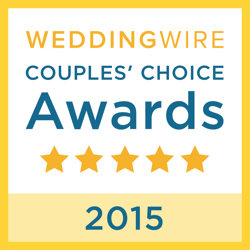 Here at Message In A Bottle, Inc. we care about quality. We make sure that the last invitation processed is as beautiful and excellent as the first. We offer a wide selection of invitations from which to choose. 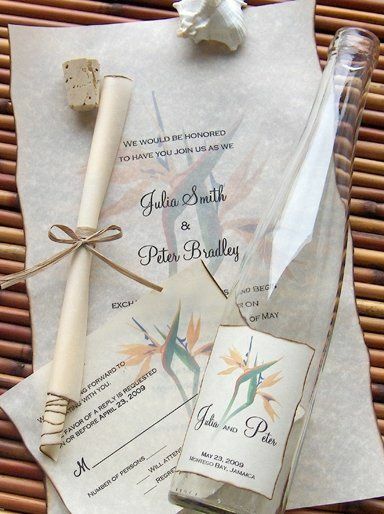 This summer you can send the perfect beach wedding invitation or seaside wedding invitation with our popular beach selections, or go with a more garden feel with one of our floral designs. 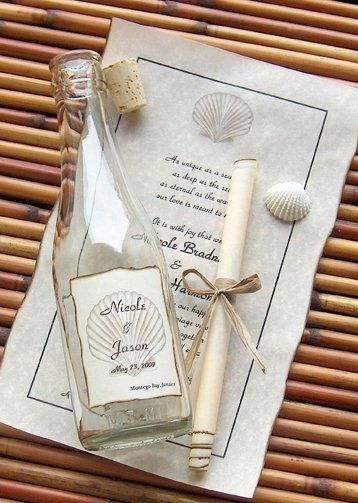 The sky is the limit when you choose genuine Message In A Bottle ® brand invitations. Here is how it works-- you choose from the USPS approved Destination Line plastic bottles, Signature Line glass bottles, or the Premiere Line glass bottles and then pick your design and colors based on your wedding theme. 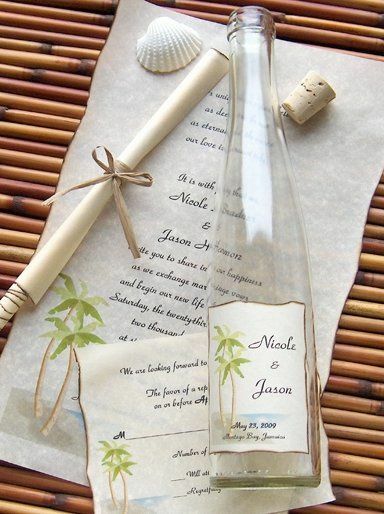 Every bottle is adorned with a custom label and is finished off with a hand-rolled invitation on the inside. These invitations are perfect for any style wedding and add a touch of elegance and originality. 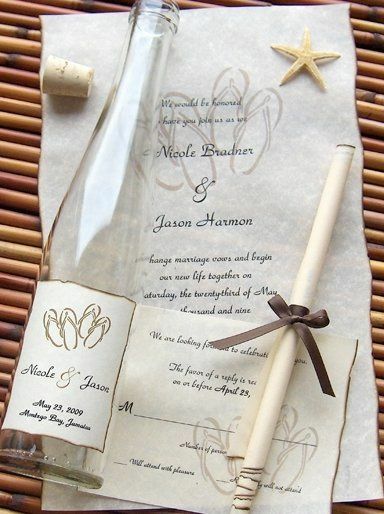 Remember that all printing, design work, materials and assembly are included in one low price; so if you are looking for a unique and memorable way to save the date or invite your loved ones to share in the most important day of your life, look no further than Message In A Bottle, Inc.
20 Reviews for Message In A Bottle, Inc. They were so amazing communicating back and forth making sure my needs were satisfied. They sent us two samples after adjusting the color from the first one making sure we were happy. We are absoulty happy and can't wait to see our guest reactions. They came fast and were beautiful I got so many compliments I didnt know how to reply. The lady who worked with me with them was so sweet and understanding. I hope to work with them again in the future. The best of the best! Worth every penny!